Founder and Director, Sarah Quin, travels the globe regularly to source and design our textile and furniture collections. Get a behind the scenes look into one of the Canvas + Sasson shoots that was shot on location in Jaipur - at the stunning heritage hotel, Diggi Palace. Our first stop was off to the flower market to source flowers for the shoot and then onto the produce market for more bowl fills. Sold by weight, the fragrant and vibrant Marigolds are threaded into garlands, which are used as part of the Hindu daily offerings, known as Pooja. They are draped on anything from doorways and trucks to the Hindu temples that are dotted throughout all Indian cities and villages. For our photo shoot we used the loose marigolds on mass to add contrast to our beautiful cushion collections - we also added flower garlands as props. 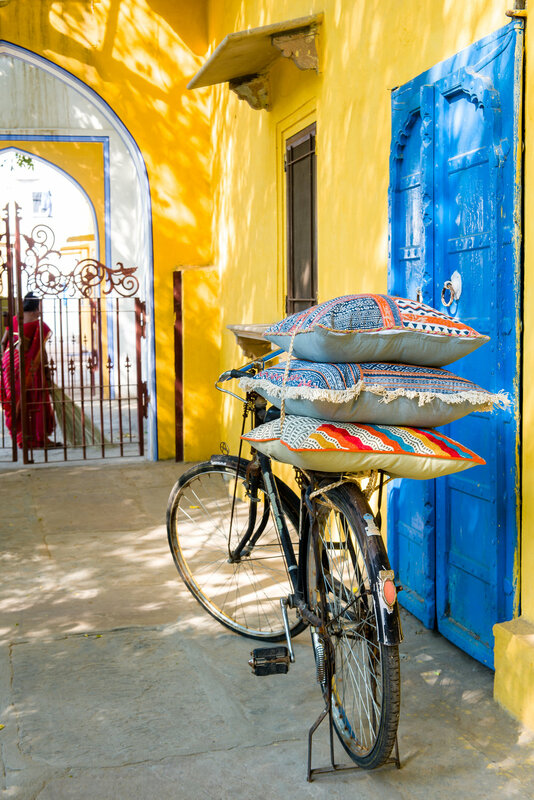 In India, it is customary that women do most of the manual labour – be it carrying bricks on constructions sites or huge hessian bags at the vegetable markets. 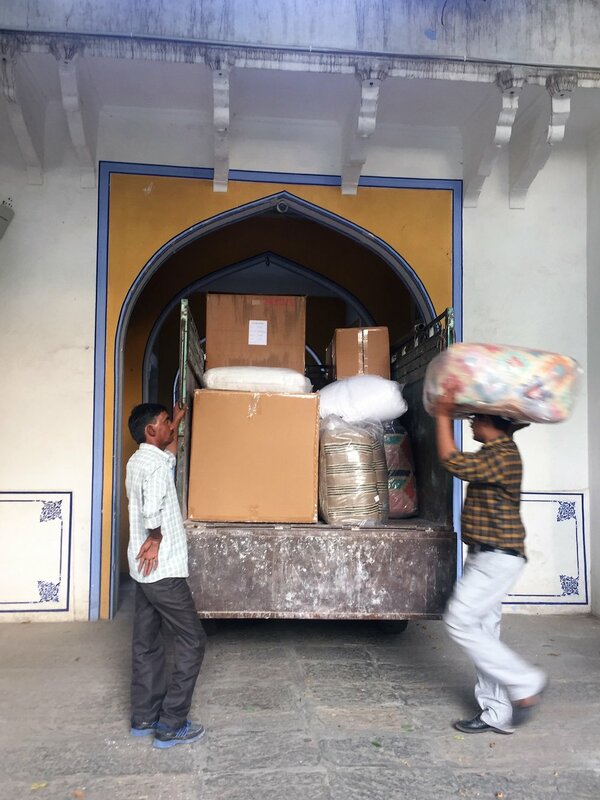 They receive tokens for each delivery made to and from different areas of the market, which are then counted at the end of a long day's work and redeemed for Rupees. In the Hindu religion, the cow is sacred and must be cared for by all. Women on the outskirts of Jaipur harvest grass for the cows and each day you can see mounds of grass on the sides of the road. Locals may pull over, buy a little grass and then feed it to nearby cows. This small act is integral to their day-to-day living and belief that all creatures, great and small must be treated equally. Next stop was the Jaipur flea market with its buzz of sounds, sights and smells. Vendors find any spare space in amongst the flower and vegetable sellers, with side-of-the-road makeshift displays. Here you can buy anything and everything and if you know what you're looking for you can find some absolute vintage gems. The markets start early on a Saturday morning and like any good bazaar, the earlier you arrive the more treasures you will discover. Bargaining takes time and patience, but there are some amazing deals to be made. We sourced everything from vintage clocks, padlocks, chests, tin jugs and wooden carvings to use as props on our photo shoot. On the streets in India you can flag down a truck as you would a taxi, this was very useful for transporting our products to the photo shoot location. Around town, it’s common to travel in a three-wheeler auto rickshaw, known as a ‘tuk-tuk’. Even the school children are delivered to and from school in rickshaws. As the traffic is always crazy, this is a quick way to get around. Each day we travelled to work and shoot locations in the Doris Express! The perfect way to really experience a city. We were very lucky to have our good friends join us in India making the adventures even more special. Chyka has been a friend for many years and we always enjoy supporting each other's creativity. She has a beautiful website and blog www.chyka.com and her styling skills are incredible. We had a blast together styling the photo shoot and playing around with props on set. Travelling overseas is a crucial part for any creative business. In order for the Canvas + Sasson collections to evolve the products must remain fresh and new. 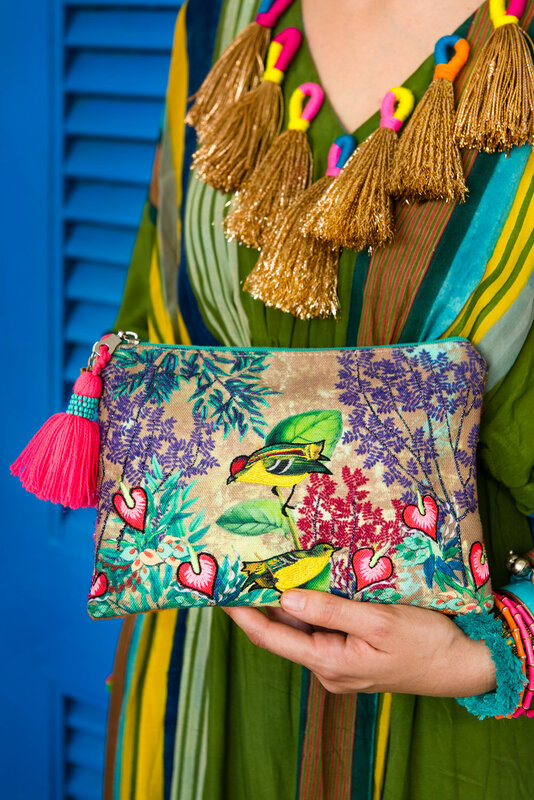 We now have a beautiful range of bags and clutches including Curio, Carmel & Bohemia. The inspiration for these new ranges is gathered all over the world from India to Greece, and anywhere from the hotels to the beaches to the markets. Pom poms and tassels are a common theme in the new products and you can see how different elements seen over the world can translate into details that make a collection.